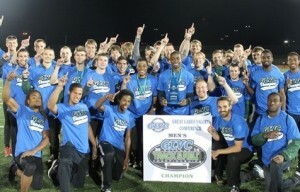 Missouri S&T men’s outdoor track team. Missouri S&T’s men’s track & field team stormed to its first Great Lakes Valley Conference championship since 2009 as it captured six events and posted 29 scoring performances in the two-day meet at Lewis University. The Miners won their second GLVC title since joining the league on the strength of not just the six first place finishes, but also five second place performances over the two days. S&T finished the meet with 172 points, easily outdistancing four-time defending champion Indianapolis by 48 points. Two of the six event wins came from Adriel Hawkins (Jefferson City, Mo./Jefferson City), who completed an indoor-outdoor double in the 200-meters Saturday to go with his win Friday in the triple jump. Hawkins, who had the best time in the preliminaries of the event Friday, won the final in a time of 21.70 seconds for his second outdoor 200-meter title. The other winning performances Saturday for the Miners came from Jusean Archibald (Bridgeton, Mo./Trinity) in a highly-competitive 110-meter hurdles race and from Trevor King (Union, Mo./Union) in the decathlon. Before Indianapolis’ four-year run as league champion, the Miners were the last team to capture the GLVC title when it won the 2009 meet. 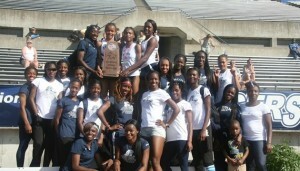 Lincoln University women’s track team. For the fourth year in a row, the Lincoln women’s outdoor track & field team is an MIAA champion. Competing at their home track, Dwight T. Reed Stadium for the first time since 1999, the Blue Tigers won the 2014 MIAA Outdoor Track & Field Championship on Sunday, marking the fourth time in the past four years that LU has accomplished that feat. The Blue Tigers scored 182 points to win the team title over second-place Central Missouri (104.50 points) by more than 70 points. Lincoln won eight events and posted 28 top-eight finishes with Monique Thompson, the winner of the 800m, breaking a meet record. Thompson, who took the finals of the 800m in 2:08.24, won the preliminaries of that event in 2:08.05 to break the previous meet record of 2:09.66, set by Lincoln’s Lovan Palmer last year. Both times are automatic qualifiers for the NCAA Division II Outdoor Track & Field National Championships. Thompson later took second in the 1,500m in 4:38.42 while Jhevere Hall placed fourth in both the 800m (2:08.91) and the 1,500m (4:42.21). Yanique Ellington was a double winner for Lincoln, taking both the 100m (11.59) and the 200m (23.76), with her time in the latter race being an automatic qualifier. Janae Johnson was the runner-up in both races, finishing the 100m in 11.66 and the 200m in 23.85. Judith Riley placed fifth (12.18) in the 100m and seventh (25.47) in the 200m while Kimberly Bailey took fifth in the 200m (25.06) and sixth in the 100m (12.21). Ellington, Johnson and Bailey later teamed with Ladonna Richards to win the 4x100m relay with a time of 45.74. Donna-Lee Hylton set two automatic qualifying times at the league championships, including in the 400m dash, which she won in 53.16. Tamara Keane was the runner-up in that race, clocking in at 53.75, while Willomena Williams came in sixth (54.94) and Palmer placed seventh (55.86). Hylton, Keane and Williams later teamed with Marcia Harrison to win the 4x400m relay in 3:38.15, another automatic time. The Blue Tigers also swept the two hurdle events, with Juneille Barker taking the 400m race in an automatic qualifying time of 58.69. Ladonna Richards placed third in the 400m hurdles at 59.7 and Keane finished fourth at 1:00.44. Richards was the winner of the 100m hurdles, finishing with the top time of 13.54. Barker was the runner-up in the 100m event, clocking in at 13.70, while Nadia Harriott came in seventh (14.68). Jonelle Campbell and Nickeisha Beaumont both had third-place results in field events. Campbell took third in the triple jump (11.95m) while Beaumont took third in the long jump (5.89m). Daniele Newman competed in several field events, finishing fourth in the triple jump (11.85m), ninth in the high jump (1.64m) and 12th in the heptathlon (4,207 points). Shakeisha Miller took fifth in that last event, earning 4,756 points, and also placed 10th in the long jump at 5.51m.